Lanyard with toggle can secure hat under chin. Brim can be folded up and secured in place. British desert dpm jungle hat Size 55. Condition is Used. Dispatched with Royal Mail 2nd Class. 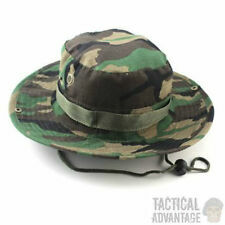 Highlander British DPM Jungle Hat. Size - 55cm. 70% polyester 30% cotton. British Army Issue Jungle Hat/Floppy Hat Size 55. Condition is technically Used but in original condition. Dispatched with Royal Mail 2nd Class. Genuine issue old school fabric jungle hat in early colour DPM, with early glossy fabric labels. Rare, unissued condition. THE CLASSIC HAT MODIFIED WITH SHOTER BRIM TO 4CM WIDE BRIM TO KEEP SUN AND RAIN OFF HEAD AND NECK YET NOT TOO BIG TO GET IN WAY OF WEAP0N SIGHTS , MADE FROM LIGHT WEIGHT jungle / tropical dpm material SO ITS COOL BREATHABLE AND DRYS SUPER FAST FROM WET . Color = BRITISH army desert dpm camo. 100% GENUINE BRITISH ARMY ISSUE " BOONIE " jungle HAT unlike the poor quality cheap fake ones this is real deal best there is issue one. a rare tiem for the collector these smocks were bought in with army surplus wholesale dpm smocks gov surplus released item. New unissued condition, standard British DPM camo pattern. This example is size 57cm head circumference. This is a latest issue jungle boonie hat, as worn by UK forces on tropical and jungle operations. New unissued condition, standard British DPM camo pattern. This example is size 58cm head circumference. This is a latest issue jungle boonie hat, as worn by UK forces on tropical and jungle operations.